Modern arrangement with purple Singapore Orchids in a glass vase. 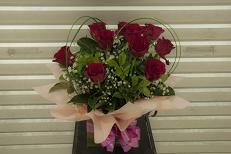 Impressive mini box arrangement with romantic red roses designed with a speargrass-made heart strip. 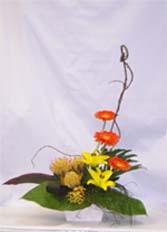 A medium cheerful mix box arrangement with bright orange and yellow flowers. A medium cherry mix box arrangement with a vibrant combination of pink, purple and red flowers. Delux Showers of (pink or white) oriental lilies and (hot or pale pink) gerbras displayed in a glass vase. 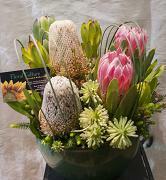 A long-lasting mix arrangement of Australian Natives presented with Banksia, Leucadendron and Proteacea species in a green ceramic pot. Elegant arrangement with a combination of soft coloured flowers and brilliant colours of birds of paradises. Tall arrangment of traditional and modern Australian native blooms displayed in a green seramic container. 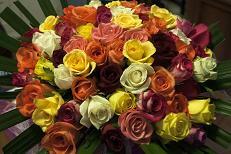 Stylish bouquet with mixed colours roses. Delicate bouquet with fashionable hot pink roses. Divine bouquet with beautiful rainbow roses. 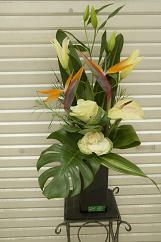 Graceful bouquet with mixed colours tiger lilies. 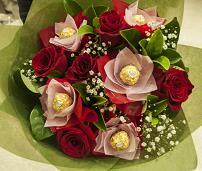 Luxurous bouquet with expressive red long stemmed roses and lustrous gold-paper wrapped Ferrero Rocher. 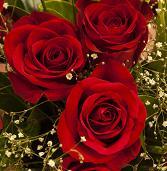 Just to say "I LOVE YOU"boquent presented with three red Colombian roses. Romantic boxes with pink lillies, pink gerberas, daisy and soft greenery. A mix of bright and vibrant blooms in a blue ceramic pot. 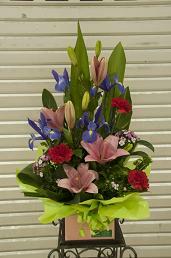 Flowers include waratah, king proteas, bamboo stick, liatris and stunning foliage. This modern bouquet made of lilies, gerberas & iris. Send best wishes to a loved one. Pink and White are always popular as shown in this design. 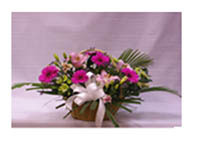 A modern or formal arrangement of seasonal flowers in bright or pastels, delivered in a flower basket. 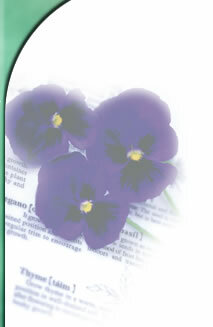 Easy care for the recipient, just refresh with water daily. Lovely basket made of hot pink gerberas, lilies and variety of foliage. Forever Yours - A mix of bright and vibrant blooms in a ceramic pot. 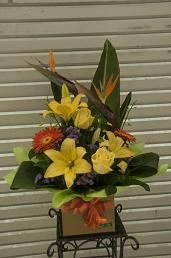 Includes gerberas, lilies, leucospermum and a variety of foliage. 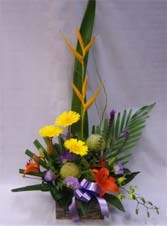 Talk of the town - This bright & cheerful arrangement includes heliconias, gerberas, banksia, singapore orchid & more. Very popular & eye catching. 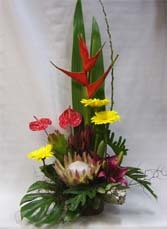 Tropical Affairs - This tropical arrangement include crab claw, king protea, gerberas, natives, gum nuts & palm leaves. Tulips & Roses - A stylish design of Roses & tulips for the upcoming season.